Report: Day 1: Two hours is normally regarded as a maximum time for active exercise without a break. Crossings in excess of 10km, such as from the mainland to the closest of the small isles, Eigg, are therefore regarded with caution. 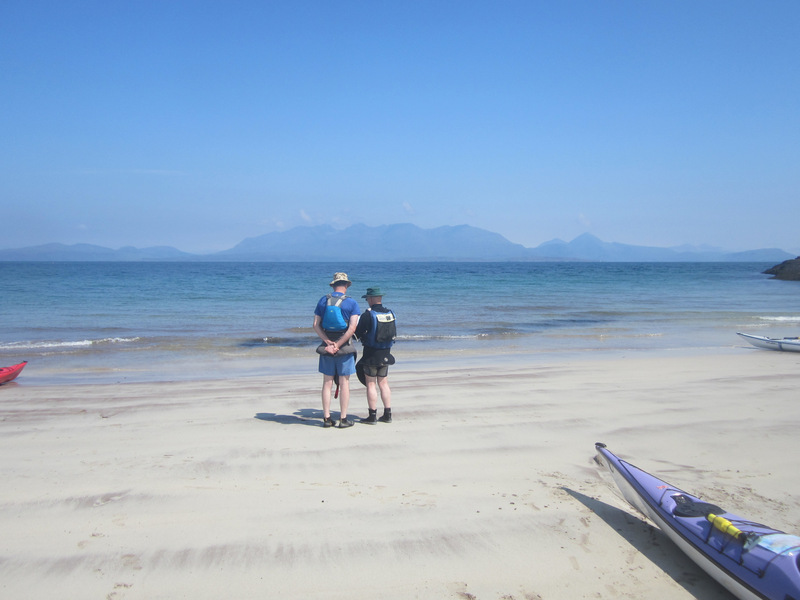 We left Helensburgh just after 8am arriving at the Back of Keppoch Campsite, by Arisaig at 11.15. 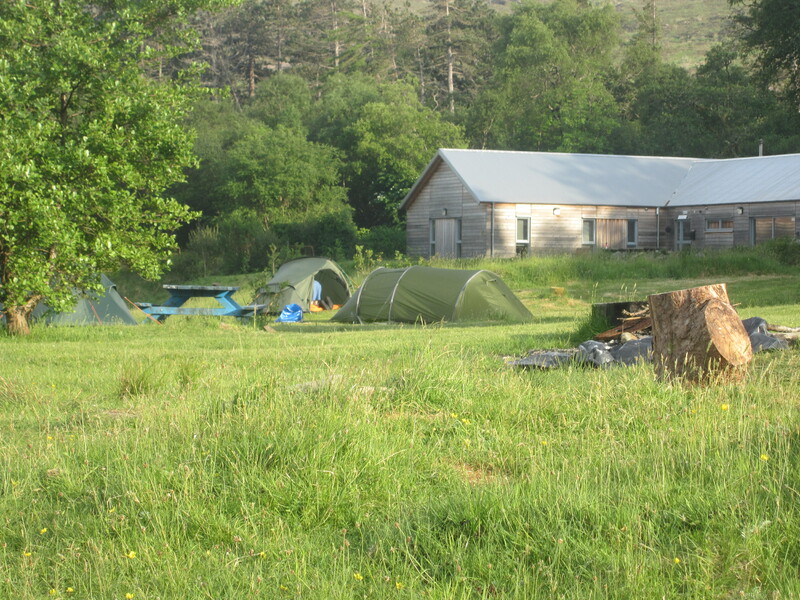 The campsite is thoroughly recommended with access directly on to the beach and no charge for parking. 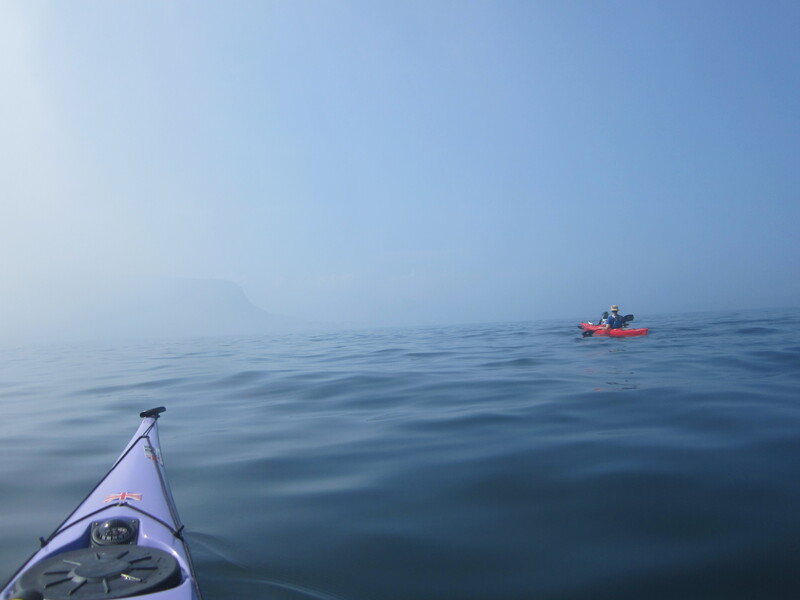 After packing the boats and lunch we finally set off about 12.30 into the sea mist that prevented any sight of Eigg. There is a shingle beach at the north end but camping is impossible there and Hugh was anxious to source a camping spot for future reference so we pushed on round the point to a potential area. 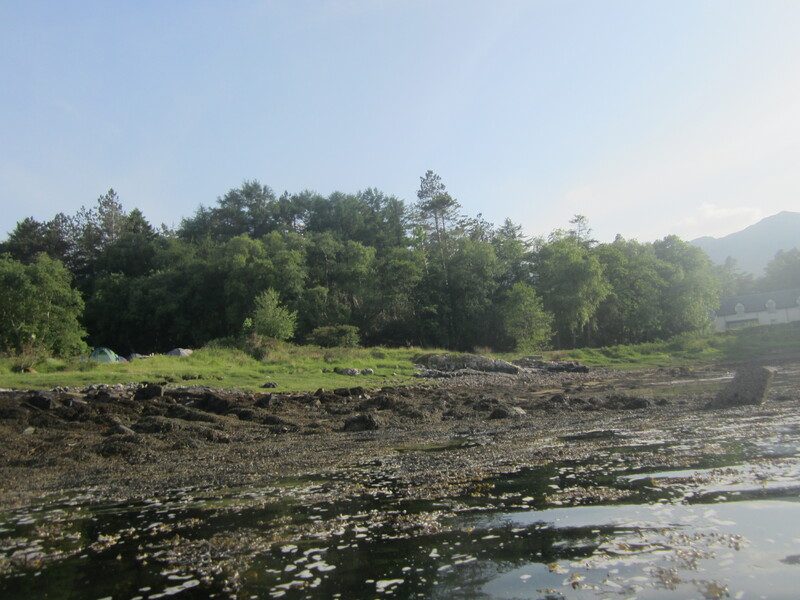 Sadly landing was on to weed covered rock and the possible campsite turned out to be a small weed infested sea water based bog. After coffee we pushed on again into the mist surrounding our next target Rum. As we paddled the mist slowly rose giving a beautiful late afternoon. 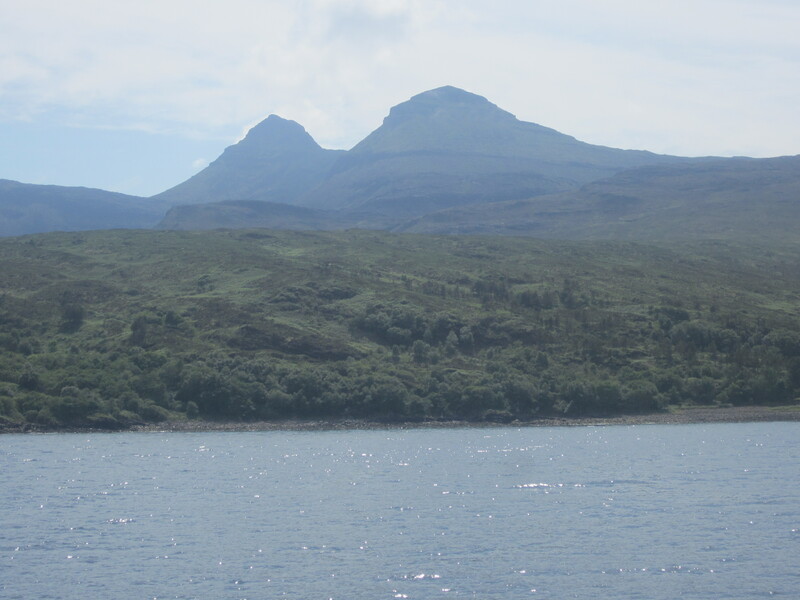 The south of Rum has virtually nowhere to land and no camping spots until Kinloch, at the head of Loch Scresort. Day 2: The midges were still there in the morning in even greater profusion. A quick getaway saw us on the water about an hour after exiting the tent and into the midge free zone on the loch. At the mouth of the loch we were surprised to come across a couple of kilometres of quite serious water, with the meter swell occasionally breaking on to the boats. 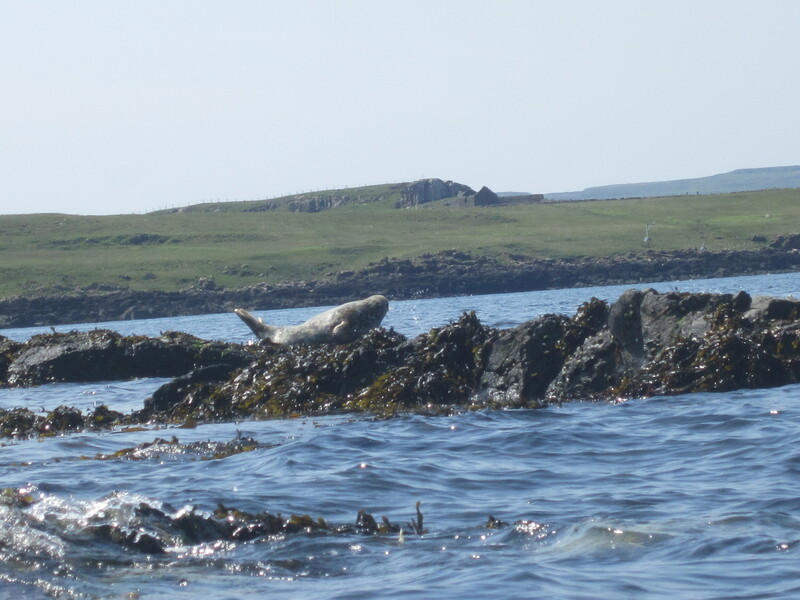 A cup of tea and a laze in the sun was the order of the day before the crossing to Canna. Before crossing we travelled a little further west to the sand beach at Kilmory, a farmstead that houses the Deer Research Station. 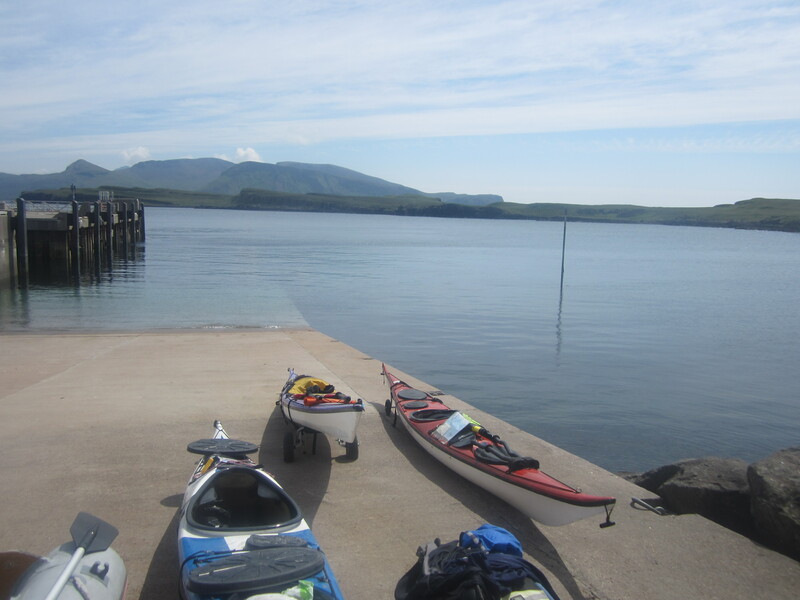 From there we set off on the 9km paddle across the Sound of Canna to the harbour at A’Chill. The previous night Hugh had inadvertently stepped off a bank and jarred an already strained back. 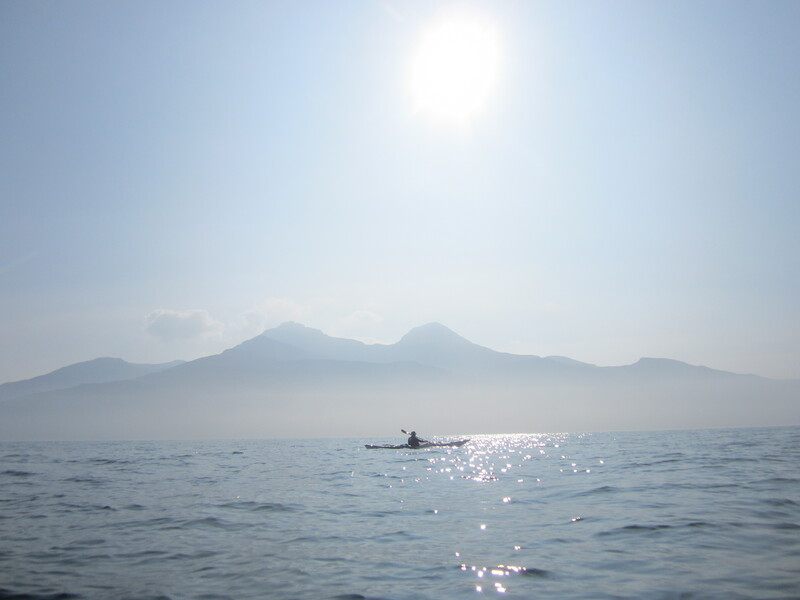 On the crossing his discomfort grew to a level that on reaching Canna made further paddling too painful and potentially damaging. 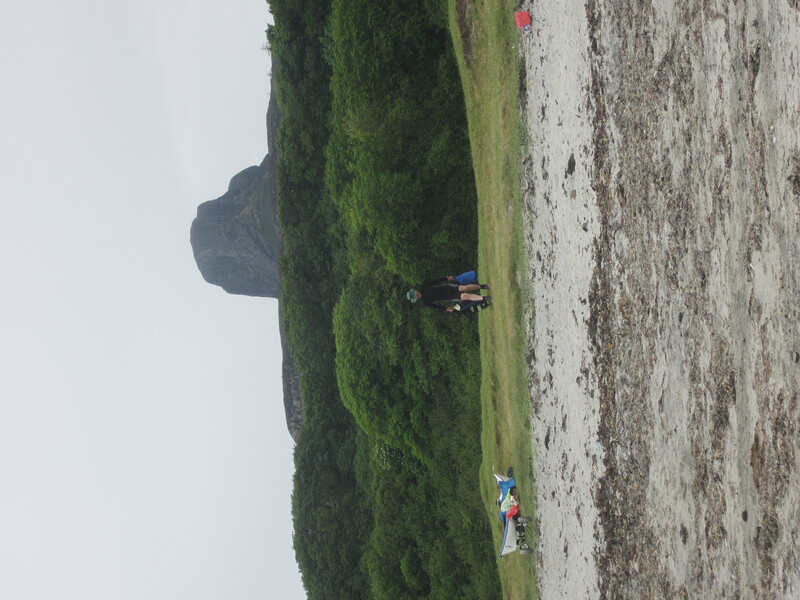 The campsite itself is at the edge of another glorious silver sand beach and virtually midge free. What a pleasure! The evening was spent repairing the trolleys and debating loudly. 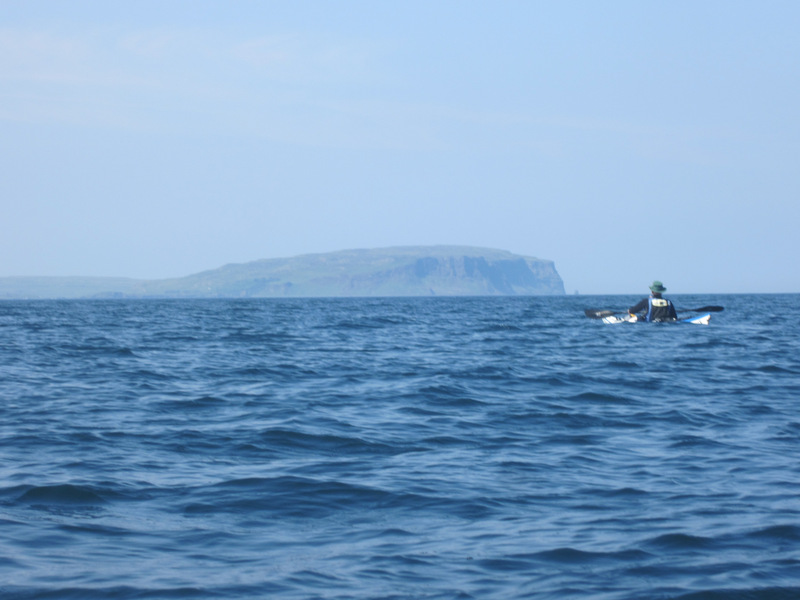 Day 3 Although there was some recovery it was agreed that the risk of going down the exposed east side of Rum, which only has one very poor landing and crossing the Sound of Rum (which can be dangerous) to Eigg, a distance of 28km, was simply too risky. Instead we opted to take the ferry, the Glen Nevis, to Eigg. 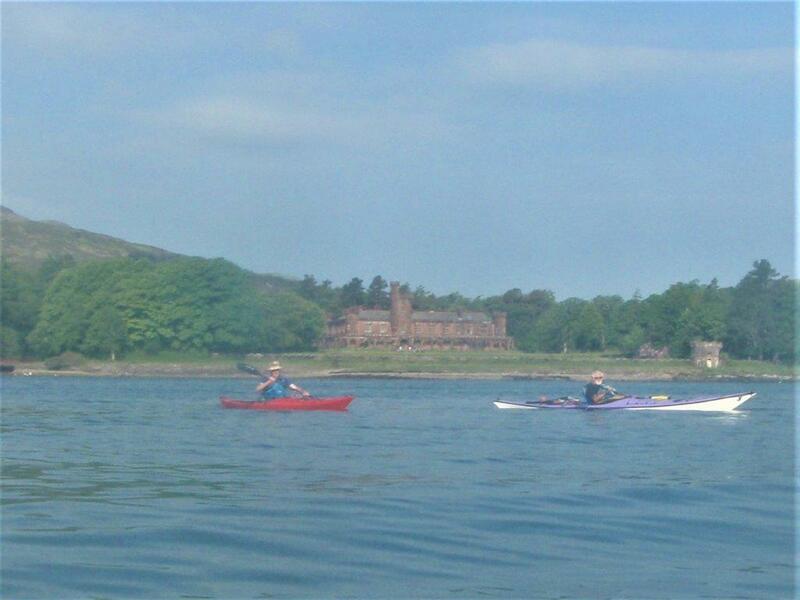 A very relaxing morning followed with a very gentle paddle to the pier and a coffee at the cafe/shop. Using the ferry to avoid the long crossings is a very pleasant alternative. 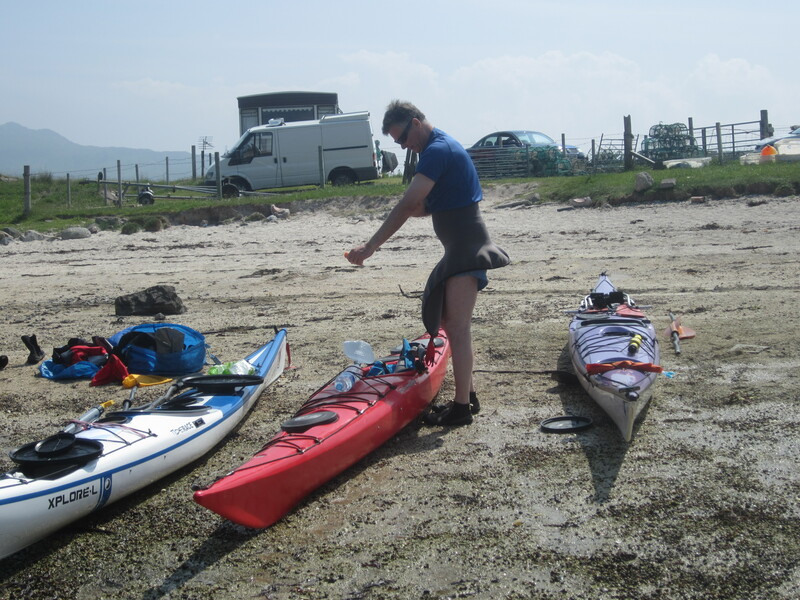 Fares are low (£5.90 Mallaig to Canna) and the kayaks go free. 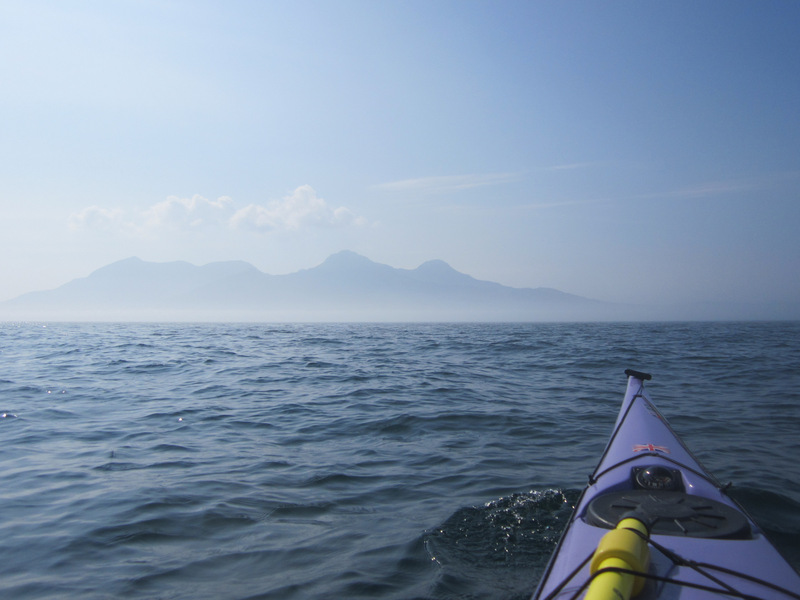 On the Rum-Eigg leg there were 5 different groups and 15 kayaks on the boat. 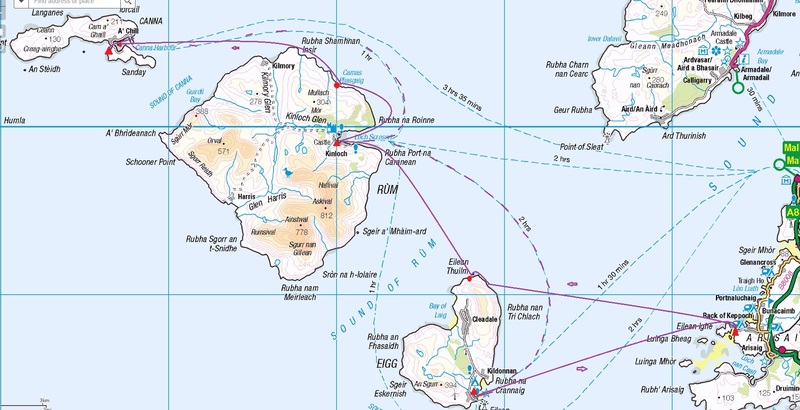 A return to Canna with a circumnavigation is high on my “to do” list. Adding to the pleasures of the scenery were the gastronomic delights of freshly cooked fish and chips washed down with tea. 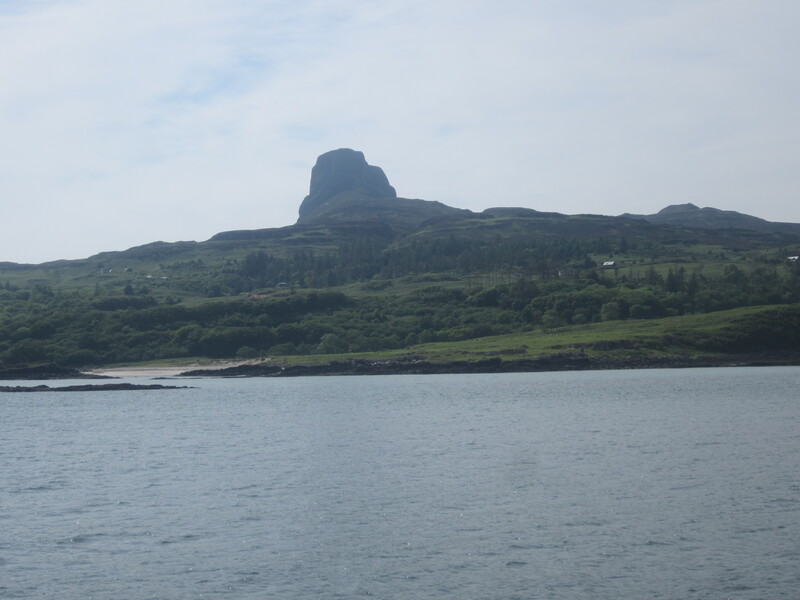 After Rum the boat progressed on to Galmisdale, the focus of life on the island and our destination. 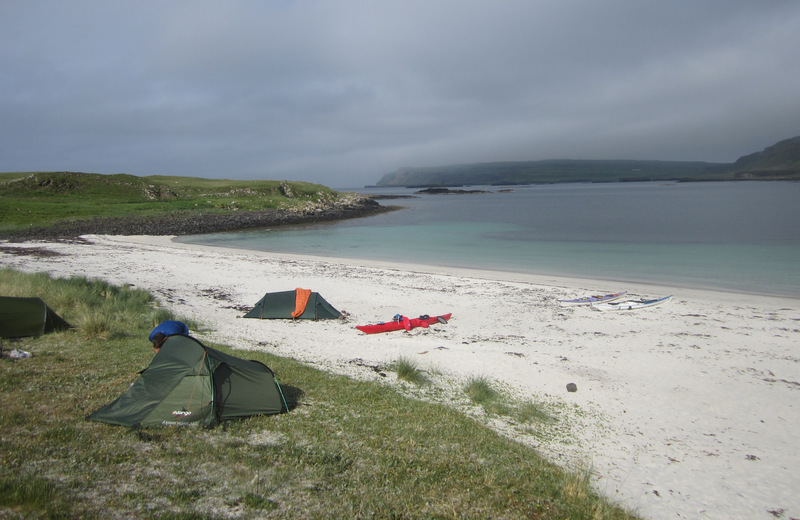 The camp site is just across the bay from the pier and the excellent cafe/shop/bar. There is a very basic toilet and a lot of flat grass for free. The chance find of a plank of wood and the deft use of the excellent saw on both plank and a colossal tree trunk, provided enough wood for the only camp fire of the trip. 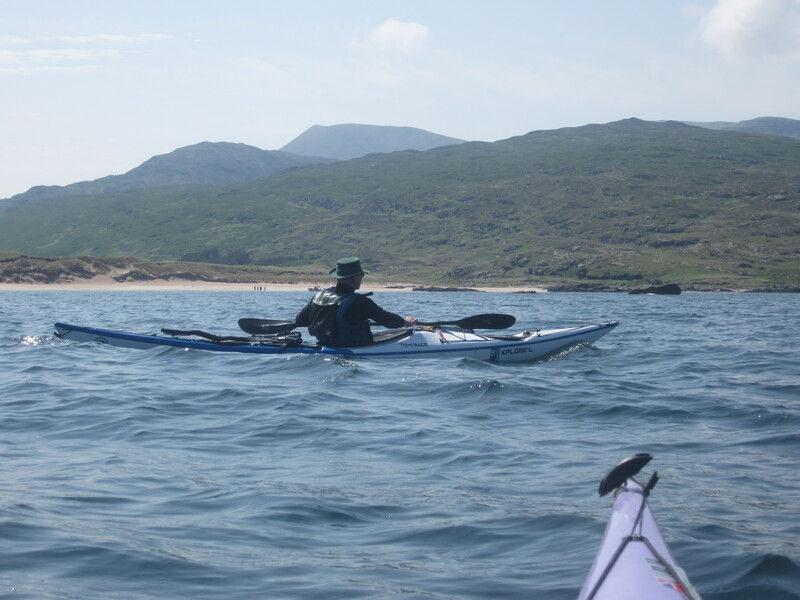 Day 4: Time had improved Hugh’s back and he felt confident of making the crossing. 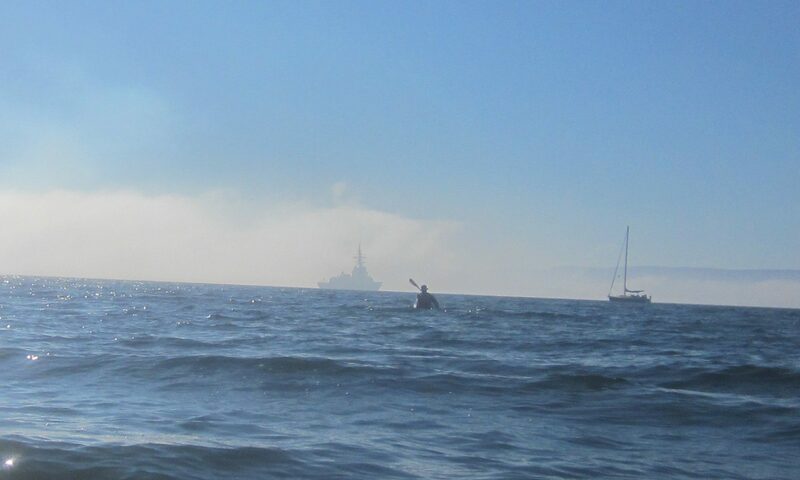 The conditions were ideal; cool and flat calm. The mainland from the camp site with sheep. It looks a long way away. The journey over took just under the expected 3 hours and was pleasant and uneventful. 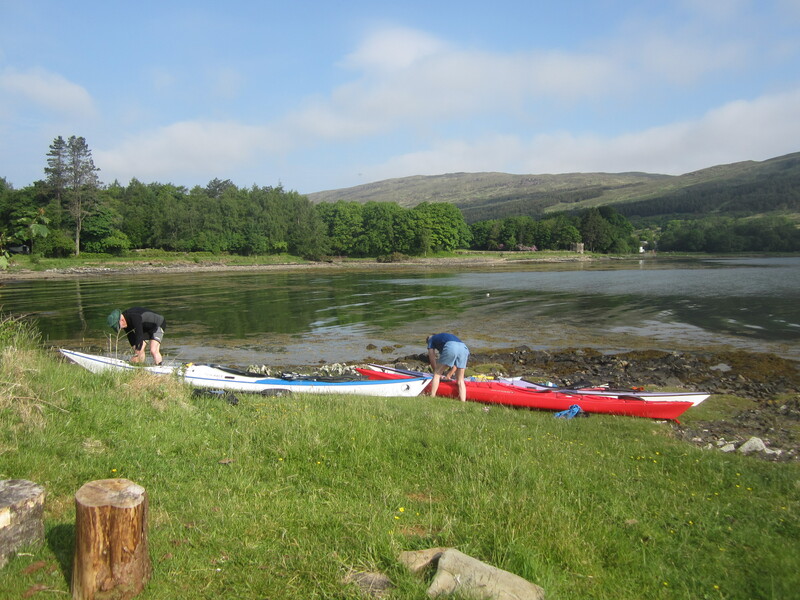 The final problem was actually finding the campsite.The inlet is hidden from the open sea and our search was not helped by the high tide significantly altering the scene. We finally arrived almost dead-on three hours after we departed. Lunch, loading, a drive and a cup of tea in Ballachulish brought us back to Helensburgh by 6pm. Overall it was a good trip with fantastic scenery and excellent weather. 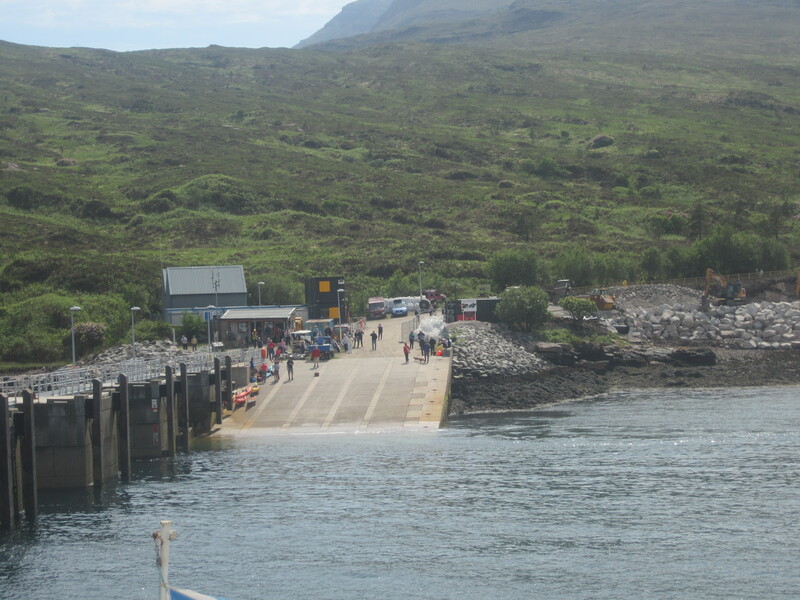 A return to Canna using the ferry is required.